Professional chefs at the highest level tend to be men. But there are some great lady chefs. One of the very greatest is Anne-Sophie Pic-Sinapian. She is part of the famous Pic dynasty. Her family began to cook for the public in 1891. 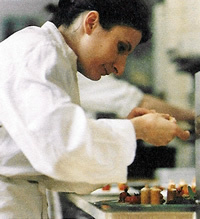 Her father, Jacques Pic, was one of the most highly acclaimed chefs in France. I had the privilege of eating his food on several occasions, and can testify to his culinary genius. After his untimely death, the good burghers of Valence did the right thing: they erected a monument to the man who had drawn gourmets from all over the world to their town. Now Anne-Sophie has three Michelin stars and commands the stoves at 285 avenue Victor Hugo. This is the place which all serious lovers of good food know simply as Pic. 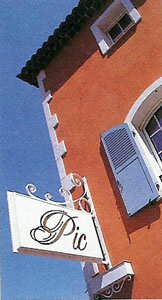 The Sinapian part of Anne-Sophie’s surname comes from her husband, David, who is the General Manager of the establishment. For Pic is not only a restaurant; it is also an hotel of considerable charm and character. Indeed, it is rather like an oasis of luxury in what is, it must be admitted, not the loveliest urban landscape in France. Having manœuvred the Royce into the underground car park (provided free of charge), I was soon settling into room number 14. If you like things modern, you will like this air-conditioned apartment. It has been renovated in what I believe is called ‘the designer style’. Contemporary prints adorn the walls, and tone in with the colour scheme of red, black and grey. Spotlights provide the lighting. I was at first perplexed by the square stone wash basins, for there were no plugs; but it was interesting to have a shower (there is no bath) surrounded by dark grey slate. This billet costs 246-286 euros a night, according to season, bed and breakfast for two. Down in the restaurant there were more signs of contemporary taste – in the new (comfortable) armchairs and in the grey suits of the staff. I felt an air of appropriate sophistication as I made myself comfortable within walls adorned with crimson velvet and bleached wood. Napkins were replaced if diners left the table and the glassware was by Riedel – two reliable signs that high standards prevail. Two set menus are available at dinner: 5 courses at 115 euros and 7 courses at 150 euros. My own 6 course meal took dishes from both menus. Before they arrived, there came a small miracle. The amuse-bouche of foie gras crème brûlée was astonishingly good. Its sweetness and flavour made me long for more, but it was soon on to the first course, a pretty and refreshing roundel of red, green and yellow tomato with lobster and aspic. Next was marinated langoustine, roasted with sage and served with an intriguing hint of coffee. Sea bass with caviar followed. I think I have eaten this dish every time I have visited Pic. It is, in my judgement, one of the great dishes of the world. It has been lightened since the days of Jacques: the cream sauce now has champagne and is frothy. The first mouthful continues to be one of the most life-enhancing moments of restaurant eating. My meat course was rack of lamb – tasty, soft and tender, although my palate questioned the partnership with anchovies. Finally, after some fine cheeses (including Époisses and Roquefort), I devoured a wonderfully architectural pudding of chocolate and red currants. Food of such quality deserves to be accompanied by wines of impeccable breeding. Head sommelier Denis Bertrand has built up a remarkable cellar. It includes 400 offerings from the local Rhône vineyards – from a 2003 Crozes Hermitage for 45 euros (A.Graillot) to a 1961 Hermitage La Chapelle for 5,000 euros (P.Jaboulet Aîné). Burgundy drinkers also have their treats, like 1972 Romanée-Conti at 3,200 euros, as do lovers of claret – with 1953 Haut Brion at 1,070 euros, 1978 Ausone at 580 euros and 1982 Mouton Rothschild at 1,220 euros. From my own Rhône drinking, I would commend to your notice a blend of syrah and grenache from the Côtes du Vivarais, which was hot, plummy and tannic (Haute Vigne, Dom. Galetty, 2003). Before I trundled away in the Silver Cloud the following morning, I relaxed in the small, vaulted breakfast room. Here I consumed melon and prosciutto, fruit salad, brioche, bread and jam, and coffee from a giant cup. This excellent start to the day put me in mind to be philosophical. But I still could not understand the rarity of great women chefs. I resolved that I should simply be thankful for Pic and for the brilliant Anne-Sophie. 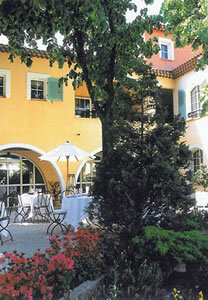 285 avenue Victor Hugo, 26000 Valence, France.